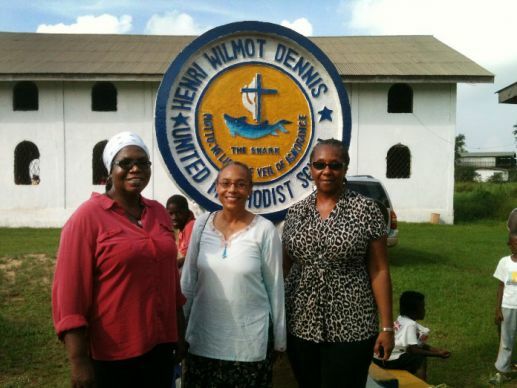 The General Board of Global Ministries’ assigned missionaries now working in Liberia (from left) are Priscilla Jaiah, Helen Evans-Roberts, and Mary Zigbuo. A $15,000 Ebola response grant from the United Methodist Committee on Relief has made Christmas a lot brighter for 350 families in the Topoe Village, outside of Monrovia, with the distribution of much needed food. “This is going to make my Christmas better,” said Soko Kanneh, one of the recipients of a month’s ration of rice, fish, beans, salt and vegetable oil. Mammie Myers, a pregnant woman, walked away with a 25-kilogram (55-pound) bag of rice on her head. “It came on time, thanks to the church,” she said of the food. 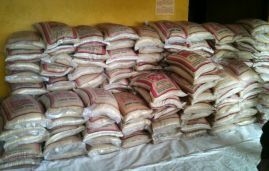 The stock of rice before the distribution at the Henri Wilmot Dennis United Methodist School. Photo by Julu Swen, UMNS. Henri Dennis United Methodist School and Lott G. Matthew United Methodist Church led the distribution of the food, giving priority to the physically challenged, pregnant, elderly and survivors of Ebola. Mary Zigbuo, a United Methodist missionary, watched and followed when Mardee Kpoo, 78, and her sister and three great-grandchildren walked home with their provisions. One of Kpoo’s 11-year-old great-granddaughters balanced a bag of rice on her head. “I could tell this little one was accustomed to carrying large loads atop her head,” Zigbuo said. Kpoo told Zigbuo that said since 2010, she and her three great-grandchildren have been surviving off the generosity of their neighbors and a modest market of producing and selling palm kernel oil. “Restricted movement throughout the country, because of the Ebola epidemic, forced the closure of schools, offices and businesses. People aren’t receiving salaries. Communities that routinely provided food and shelter for abandoned, elderly neighbors are strained to continue this,” Zigbuo said. Kpoo had been praying for food daily. Someone from Henri Dennis School came by her home a couple of weeks ago, assessed her situation and promised food for her family, Zigbuo said. The distribution was the first to this community, said United Methodist missionary Helen Evans Roberts. She noted that food distribution was another UMCOR intervention in Liberia which will affect several communities across the area including communities in Monsterrado, Margibi, and Bomi Counties. “UMCOR intends to touch lives in all of the communities that were ravished by the Ebola virus,” Roberts said. “We hope this initiative will help the people of the Topoe Village Community to take the first step towards food security,” Zigbuo said. Participating in The UMC Liberia-UMCOR distribution was Eliza Kronyan, chairperson of the Board of Trustees, the Rev. Dorothy MaCauley, director of Liberia United Methodist Empowerment Foundation (LUMEF), Joe Z. Malleh, associate director of Connectional Ministries, the Rev. Pricilla Jaiah , Roberts and Zigbuo, all representing UMCOR. Zigbuo rejoiced and cried with Kpoo and her family. Swen is communicator for United Methodist Church in Liberia. Mary Zigbuo, United Methodist missionary in Liberia, contributed to this report.